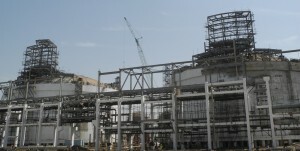 The project comprised downstream storage for Ethylene from the cracker including pumping and vaporisation facilities at the Dahej Petrochemical Complex in India. The requirement of 2 x 24,000m3 net capacity Ethylene storage tanks to act as a buffer storage for ethylene product between the Naptha Cracker unit and downstream polymer units. Whessoe performed basic and detail engineering design of the Ethylene tanks to a first flange battery limit, with the structural scope being split between Whessoe and Technip India (TPIL). Whessoe also performed the basic process engineering of the Balance of Plant (BOP) and oversaw the detailed BOP engineering design documents produced by TPIL. During the Construction phase Whessoe provided specific Engineers to support the Client.